Vole Office Ultimate 3.79 era disponibile come app gratuita il 09 settembre 2018! Vole Office is a light Microsoft Word and Excel editor, it is easy to use and low in Price. Vole Office helps you create full-featured Microsoft Word DOCX and Microsoft Excel XLSX documents and replicates Microsoft Office user experience. 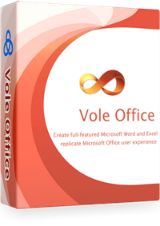 Vole Office is easy to use, inexpensive and fully compatible with Microsoft Office Word and Excel, making it the best choice for individuals and companies. 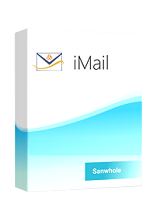 iMail è un sistema di email dedicato alle piccole aziende. Consiste in un sistema di email interne ed un sistema di email esterne. Il sistema di email interne è simile a Microsoft Exchange, e il sistema di mail esterne è simile ad Exchange Online oppure Gmail. È semplice per quanto riguarda la struttura, efficiente e quasi completamente gratuito. Downloaded and licenced on Win 10 ok. There seems no way you can click on a Word or Excel file for it to open. If you choose "open with" Vole Office you have to wait for it to load and then it's default is Word rather than Excel which I use the most. Having separate Excel and Word applications in their program folder, so files open when you click on them, would be a great improvement. Apart from that, so far, it looks good. Downloaded and licenced on Win 10 ok. There seems no way you can click on a Word or Excel file for it to open. If you choose "open with" Vole Office you have to wait for it to load and then it's default is Word rather than Excel which I use the most. Having separate Excel and Word applications in their program folder, so files open when you click on them, would be a great improvement. Apart from that, so far, it looks good. The word processor has many features and it appears to be adequate for many document needs. I tried using inserted graphics with the word wrap option. It placed the text too close to the graphic for me to use it that feature. In the comments, many people compare Vole Office software with LibreOffice, Softmaker or other office software. In fact, they are all large-scale software, have their own file format, and have their own interface style. Vole Office does not have its own file format, only supports Microsoft Word and Excel file formats. And the software interface also does not have its own independent style, just replicates Microsoft's style. 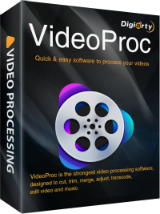 Therefore, Vole Office's advantage is 100% compatible with Microsoft Word and Excel, whether it is file format or software interface, and the operation method is 100% consistent. Other software, as far as I know, has more or less compatibility issues. I think many people will have a personal experience. I will not give an example here. You can also search and see. In short, if you submit a DOCX bid or tender file, you will not directly export the OTD or TMDX file to the DOCX file to submit it directly without checking it with Microsoft Word. In the comments, many people compare Vole Office software with LibreOffice, Softmaker or other office software. In fact, they are all large-scale software, have their own file format, and have their own interface style. Vole Office does not have its own file format, only supports Microsoft Word and Excel file formats. And the software interface also does not have its own independent style, just replicates Microsoft's style. Therefore, Vole Office's advantage is 100% compatible with Microsoft Word and Excel, whether it is file format or software interface, and the operation method is 100% consistent. Other software, as far as I know, has more or less compatibility issues. I think many people will have a personal experience. I will not give an example here. You can also search and see. In short, if you submit a DOCX bid or tender file, you will not directly export the OTD or TMDX file to the DOCX file to submit it directly without checking it with Microsoft Word. I have other Vole products and they are neat, but this one contains a virus according to Avast. It was not detected on download but on execution. Sorry. Can this licence be used for the portable version from their website? Kucera, yes, I did it.